Last December, I picked up three of Essie’s Winter 2016 polishes from Shoppers Drug Mart when they were supposed to be on sale for CA$7.99. I suspect that because they were from the new collection, they rang up at regular price. I asked if they could check the price in the flyer, and they kindly honored it for me, which was cool. The shades I got were Oh Behave!, Party on a Platform, and Satin Sister. 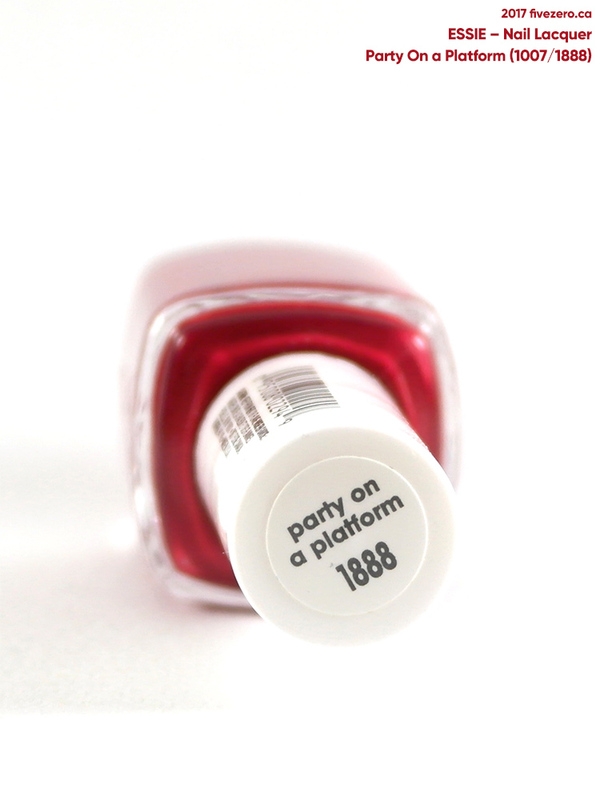 Today, I’m reviewing Party on a Platform (1007 salon / 1888 retail). 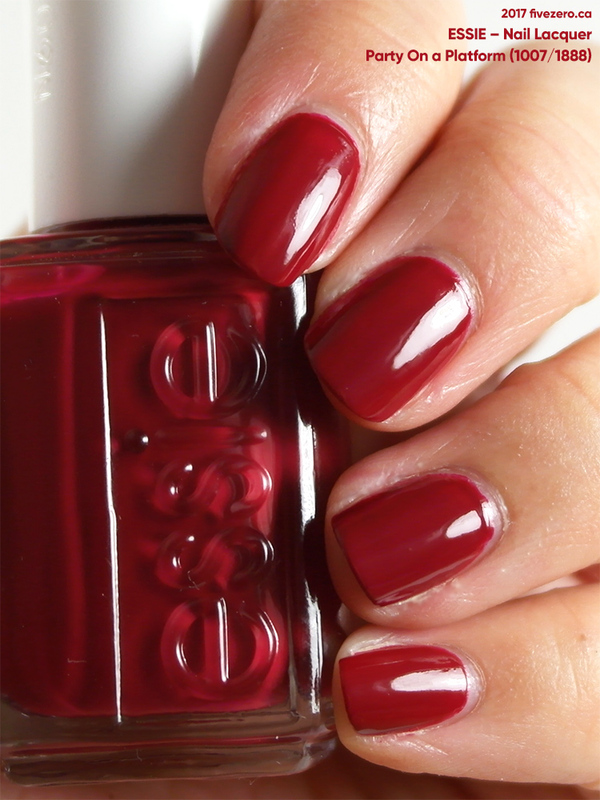 Essie describes it as a “London garnet red”. The “London” makes me think it’s that classic pillar box red, though I usually associate that color as more of a bright, true red. But I guess garnets are usually a deeper red, so that seems accurate enough. This shade is a deep red, leaning a touch oxblood and mulled wine, giving it a slightly muddied look. Depth-wise, it sits just on the non-vampy side, to me. I’ve always liked Essie red creams: yes, they do seem to do an awful lot of them, but there is usually something a little different about each one and you can’t necessarily tell until it’s on the nail. Party On a Platform is a sophisticated red and it goes easily from day to night. The formula is ever-so-slightly jelly-like (not a true jelly) which makes it ever-so-slightly annoying to get nicely even and opaque. I used three coats for full opacity. It does apply quite well, unlike some Essies that can be too thin. This is by no means a must-have shade, but I’d certainly recommend getting it if you spot it at a good price. Not really a red fan, but I love how warm this one looks! Yes! LOL. Must have every shade under the sun! Oh I think if you find the right one, it’ll look amazing! 🙂 But just about everyone can do a vampy red, too.